...and my appropriate profile pic for the occasion. Buddhism though classified by the world as a religion is more a way of life with the noble eightfold path prescribed by the Lord Buddha as he was enlightened. I recall the time when I was in school that whenever there was a form to fill for personal details requiring a religion to be written, I would always write 'Buddhist' and in my mind wonder why I would use that as my parents really didn't go to the Buddhist temple. I was never even taught the Buddhist teachings and religion to me was more about my mother praying to an idol and was asked only to hold the joss sticks to pray just on certain religious days. However I was raised to think good thoughts and do good things and that pretty much covers the objective of most religions of the world including Buddhism. The rest of our time in the family, my father led us focused on acquiring education and knowledge for a good career in the future which was the primary belief of my father if I could say so. Of course I had raised my family or the next generation in not exactly in the same path my father did. Nevertheless education or acquiring knowledge was something etched into me and even though I had finished school and qualified to become an Accountant as my father had wished, I still continued my life-long course of learning and personal research into many other different fields. 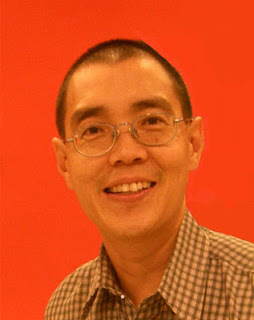 In the field of brain science, it is interesting that I found several scientists from the west to believe in Buddhism. In fact the meditating monks have been wired to instruments to study their brain patterns to contribute to many findings that we now know about the Brain and the Mind. There are psychologists such as Daniel Goleman who became renowned for his book entitled, "Emotional Intelligence" who also seem to be researching on the relationship of Buddhism and mind development as can be read here. Meditation is an area of his early studies and he had experimented on the varieties of meditation modes and over the years have settled to a Buddhist method known as mindfulness. In recent years I came across new writers on the Brain, Mind and Relationships such as Daniel Siegel when I saw him in Ted Talks, followed with buying his book entitled "Mindsight" where he explained the 9 functions of the pre frontal lobes or cortex based on latest brain research. He concluded that integration of all the functions was a key to enable one to possess the attributes of Kindness, Compassion and Resilience which would make up what one would call a healthy mind! I was impressed with his book and presentation that I continued to subscribe to his online courses at the Mindsight Institute. We can see him in a joint-workshop with Jack Kornfield, a world renowned expert in Buddhist Psychology here. So Buddhism as an age old religion or way of life has been associated to neuroscience and what science is saying is that an integrated brain results in the attributes of Kindness, Compassion and Resilience. This knowledge I believe has a solution to the problem I'm unraveling in my beloved country of Malaysia in it's political scenario as described in my blogpost on the day of the country's 13th General Election. 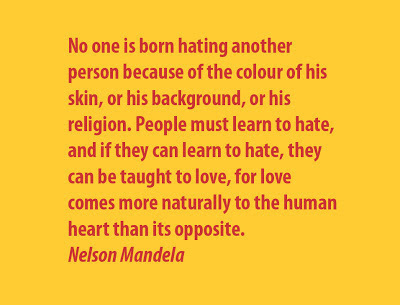 We need to promote more Kindness, Compassion and Resilience among the multi-racial and multi-religious community of the country to derive an optimal integration of it's people. We cannot let a small group of political leaders with strong influence to play the racism card to gain personal power at the expense of the country becoming more corrupted and divided which will destroy the peace and harmony that has always existed traditionally without their interference. His name is on the big board too! 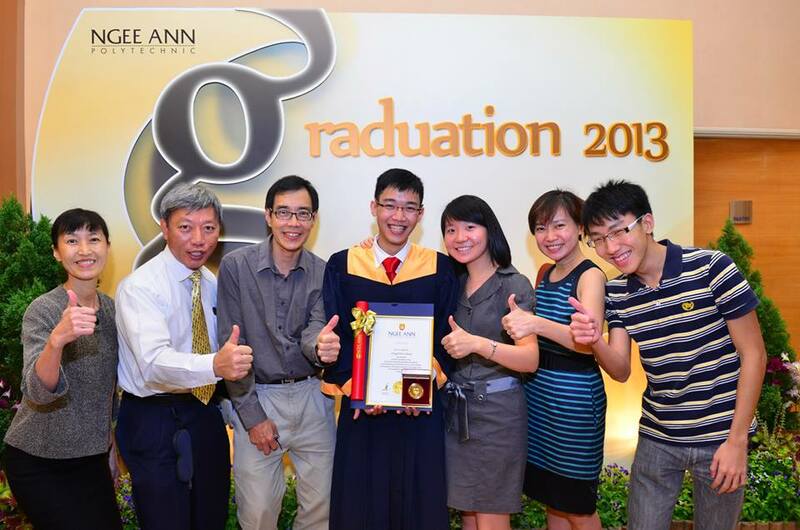 This achievement will be added to his family profile and a special video is made for him below, noting that his accomplishment also fulfils the dreams of his mother who sadly is absent today on his awards day at Ngee Ann for the first time. 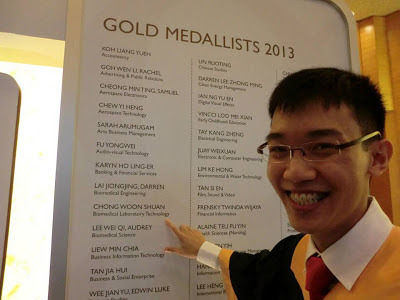 Gold Medalist on Graduation Day from Dad the KL City Kid on Vimeo. Just one parent with him for the first time in Shuan's awards day in Ngee Ann! He also had other family members, a school friend and a couple from Church to be his special guests to celebrate this momentous day with him! Here is a thumbs up pose from the same group! All of us who were Shuan's invited guests could be in the VIP area for refreshments as he was a gold medal graduate. Thanks to the Singapore government, he gets to move on to enjoy, endure and grow up to be a real man in a 2 year career in the army covered by this post. Just the day before she passed away, when I heard that she had the 'death rattle' by her doctor, I found a quiet place in a grove of trees in Kuantan, by the sea in the east coast. I posted in facebook later in the day : "I keep replaying this video as I am back in KL to make my way back to Singapore the next day, missing the serene grove of trees with the birds chirping. Life can be so peaceful as nature would provide and yet suffering and death is also part of nature, our life on earth. 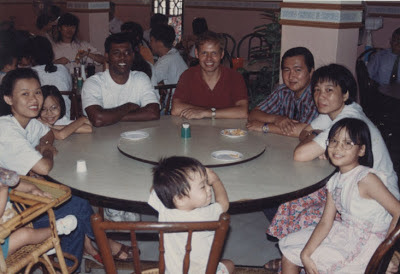 I am grateful there is a God who has shown his tender mercies for mankind"
This pic turns the clock back to the year 1994 in the month of August in an exploratory trip to consider opening up the Church in Malacca. On this table alone we have two other members called home early too at this point of writing, first Gary Orgill in red on 2nd April 2006 and later Geok Lee on the far left on 6th Nov 2012. Remember the flowers that were blooming profusely some time ago? You can see from the first picture they're about all gone except for a little one on the far right which you can see in the second picture. Lillian once told me when she was enjoying those flowers outside her window, that she hoped that when those flowers withered, she would also go with them. Her wish was granted this morning. She is now enjoying flowers far more beautiful than whatever I could offer her outside her window. Thank you all for your prayers, support, kindness and love throughout this time. On behalf of my sister, thank you for all your love and friendship to her. Thanks for everything. How grateful I am that I KNOW Lillian Lim! She has affected my life more profoundly than almost anyone I know. Thank you Lillian for your example of fearless goodness. Though you are now watching over us and we know you are not far we miss you but are ever so grateful for you. I will continue to pray for you Lillian. The flowers planted by lillian are still on the earth and just like a patch of lilies will continue to grow from year to year. The way I see it is when somebody lives a life by eternal rules the effect of their actions will remain for eternity. Susan many flowers bloom again and again and so it is with lillian. May the spirit lift you up and may our memory of lillian inspire us all to be better than we are. I am sad dissapointed and grateful all at once. Take care Seet family, I hope to visit where ever Lillian is laid to rest one day. -John p.s I am crying with you. Our condolences and best wishes for you and your family at this difficult time of separation. Reunion will be sweet and something to look forward to and work towards in faith. Our condolences to your family and we will pray for your comfort in to your feeling and May the Holy Spirit be always guide you and your family member. 3:47pmBrooke Petty left the conversation. Know that her spirit soared high to her Heavenly home..We need to be worthy of her. We love you Lillian. You are with Authur and family members. May The Lord comfort your hearts at this time of parting. My condolences to you and the rest of your family. I'm so thankful that I was given the privilege of rubbing shoulders with Lillian. 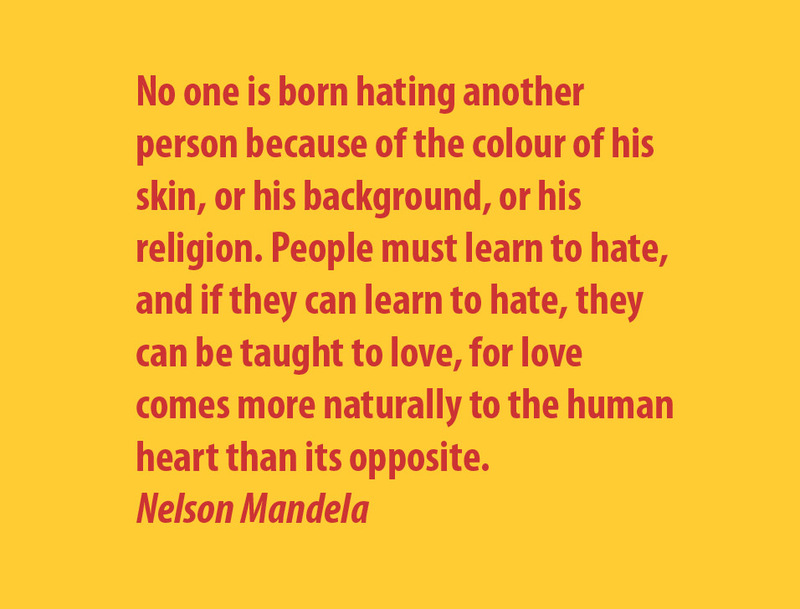 She touched my heart with her loving service and wisdom! Her gift and examples of charity will remain with me forever! Glad that her suffering is over. Our condolences to your family. I miss her already, but she is in a better place now. Thank you for all the updates. Love you all! I love all my big sisters, but now one has left. I love you Susan, I love Lillian. I will have to wait to hug her again. But that day will be here soon as well. The thing about family is they love you despite your faults. Lillian always found it in her heart to love and forgive me even when I deserved it the least. The world is worse for this loss, but Lillian is preparing the way for us. Let's not let her down. 11:43pmJulie Zurita left the conversation. It has been an emotional few days just following the comments on here and the events of the end of Lillian's life on earth. Our prayers are with you, Susan, and all of your family. Thank you for sharing this precious, private time with us. Much love from the Weist family. Susa , Micheal and Claire and all your whole family! our prayers and love to all of you! You are are a part of may husnbnd(mark Olsen) life and me . May the Good Lord will be with you and comfort you! we love you and wish, wish we could be there for you! We will miss our sweet Lillian but we know that she is a better place , resting in Peace with our loving Heavenly Father! we love her so and so grateful for the time we spent togetrher! 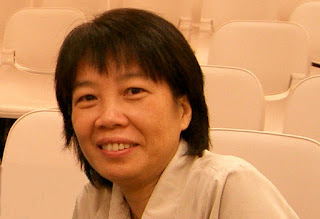 Our Deep and heartfelt condolences to lillian Lims family! Tobi and I send our love and condolences to you at the passing of one of Heavenly Father's sweetest and most valiant spirits. We will remember her in our hearts throughout our lives. She was a gift to us all. I'm sorry for your lost. Michael was her home teachers for a while and I remember those visit. You and your family, Claire are her pride and joy. I have never met Claire but the story she painted for me seems like I knew her for a long long time. We will miss her but she is not in pain anymore. She is so lucky to have you as a sister. We love you. Are you having a funeral service for her? My deepest condolences to you and your family. I am so grateful to knew her and your family. She will helping the others to know about the gospel because she ever told me she want to serve a mission. I love her and your family. 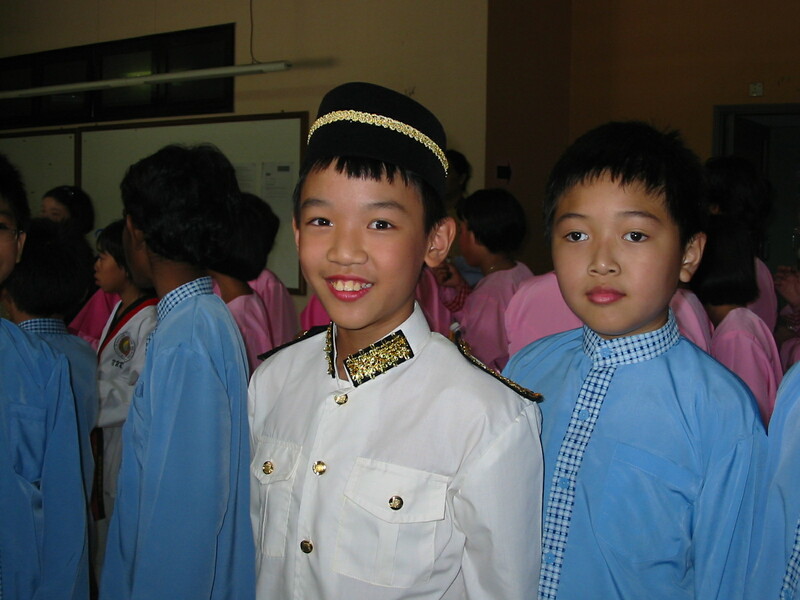 I know you guys will meet again. Please know of our sincere condolences in the passing of dear, sweet Lillian. From the entire Bradford family. The last flower on my vine was laid to rest today. There seems to be an empty space where she once was. O how I would miss her beauty and her fragrance. I know I will yet see her bloom again. In all her glory and luster she will reveal herself. But for now, I love and miss my flower, my sister, my friend. Managed to find the photo of a camera shy, humble private person who is a close friend of my wife, who also died from cancer yesterday. Her funeral is on this hour today in KL and I guess it is a loss to all of us and a gain for my wife who will get to see her again! Deepest Condolences to her family from the Chongs in US, UK and Spore except KL today! Susan, Michael, and Claire I am sorry to hear this news. Lillian was a special person; a true inspiration to those who knew her and a true Pioneer of the gospel there as a witness to the growth of the church and as a disciple of Christ! She is happy and at peace now. The best part about the Gospel of Christ is our knowledge that one day we will have a happy reunion with those we love. Until then we will miss her! Sending much love and good wishes!